1. 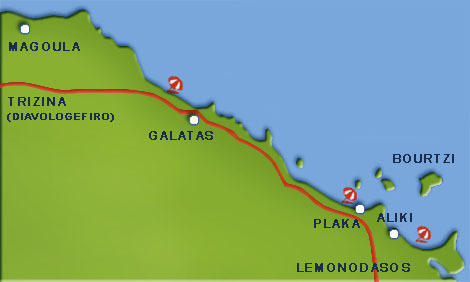 Poros - Perlia - Neorio (3 Km). From there you can continue up to the "Russian Dockyard". 5. Poros - Galatas - Lemon Tree Forest. from there very quickly to the famous "Lemon Tree forest". 5Km from "Galatas" there is the Royal cemetery in "Magoula". 7. Poros - Trizina - Devil Bridge (Diavologefiro). Ten Kilometres from "Galatas" there is the beautiful village of "Trizina" where there are the ruins of Ancient Trizina as well as the Illikos river springs, in a green fall of plane trees forfe ("Diavologefiro"/Devil Bridge) where Theseus had founded the Nymphia Aphrodite sacred place. of Argosaronikos: "Agistri", "Aegina", "Hydra", "Spetses". In July and August excursions are organized for the Epidavros Festival. Visitors can catch the bus and enjoy a day trip to Mikines and Nafplio. 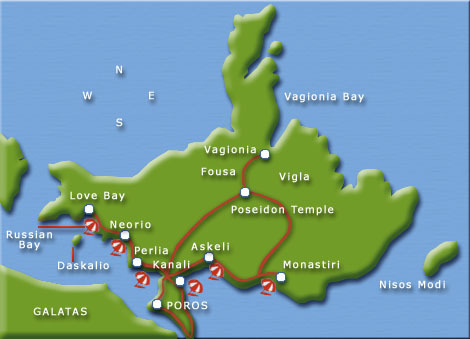 D. Tourists also can visit Aegina. Methana, Hydra, Spetses,. Porto Heli and Ermioni. There are ships that sail every day. Poros is an ideal place for vacations since visitors have also the opportunity to enjoy days trips to many destinations.